Prepare to stand your ground and enter Medusa’s lair if you dare in Medusa MegaWays. Powered by NextGen Gaming, this 6 reels, 117,649 ways to win slot comes with cascading symbols, added wilds and a Free Games feature where you can benefit from unlimited free spins and an ever-increasing win multiplier. You can also get extra wilds and scatters for even more wins. If you’re not happy, you can tempt fate and replay the feature. Highly volatile, there are wins of up to 50,000 times your stake on each spin/free spin. Medusa Megaways is powered by NextGen Gaming and has 6 reels and up to 117,649 ways to win. Using Big Time Gaming’s MegaWays game mechanic, you can play from 25p to £62.50 per spin across all devices. 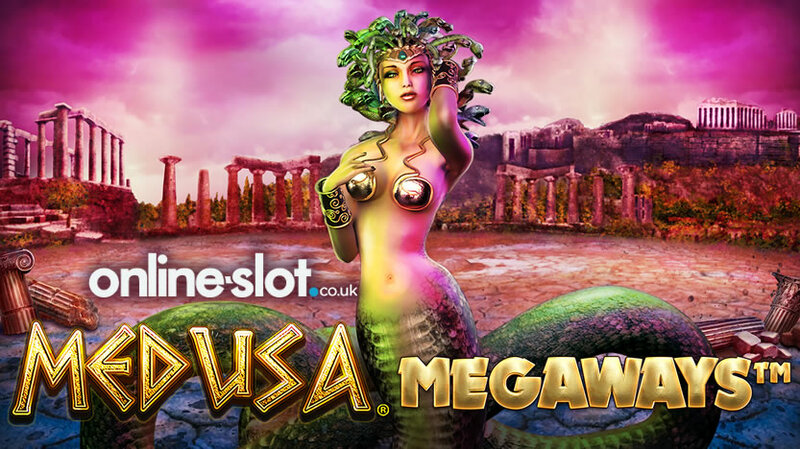 NextGen Gaming’s classic Medusa character has gone MegaWays in this highly volatile title that benefits from cascading symbols, free spins with unlimited win multiplier, added wilds, upgraded symbols to scatters or wilds and much more! NextGen Gaming has develop a few slots featuring Medusa and graphically, Medusa MegaWays is similar – based on the Gorgon who had snake locks, this ancient Greek mythology game sees ancient temples in the backdrop. Symbols on the reels include A, K, Q, J and 10 royals as well as sandals, rings, snake pendants, battling soldiers and Pegasus (the winged horse). The latter is the most rewarding giving you 30 times your stake for 6 on a payline. Medusa herself is the wild symbol and substitutes for all symbols except the scatter and soldier (more on the latter below). Using the MegaWays game engine, the number of symbol positions on each reel is determined randomly before each spin – reels 1 and 6 can contain up to 7 symbols with the other reels containing up to 6. You can benefit from 324 to 117,649 MegaWays (or ways to win). There is also an Extra Reel which adds a symbol position to each reel it appears above – this occurs on reels 2, 3, 4 and 5 only. Any symbol can appear on the Extra Reel bar the scatter and soldier. Medusa MegaWays comes with a Reactions feature – a reaction is triggered when you get 1 or more winning combinations. Each winning symbol is removed from its position with remaining symbols cascading downwards and leaving empty spaces – these are populated by new symbols which gives you the chance to win again and again (as long as new winning combinations are formed). This feature is often referred to as cascading symbols. The game has a Medusa’s Gaze feature which may be triggered when 1 or more wilds appear on the Extra Reel – all reels directly below the wilds may be covered by Medusa giving you wild reels. The Medusa wild can replace any symbol bar the scatter. This can be retriggered after each reaction. Medusa MegaWays is all about the Free Games feature though – this is played when you get 3 or more Medusa logo scatters anywhere on the reels. 3 scatters will give you 10 free spins but each extra scatter will give you 5 more free spins. Once in, you will benefit from the Unlimited Win Multiplier feature – starting at 2x, each reaction (win) will increase the multiplier by 1. This can increase indefinitely too! Within the Free Games feature, there’s a Snake Strike feature – snakes appear to the left and right of the Extra Reel during the feature. When 1 or more soldier symbols appear on the Extra Reel, the feature is triggered. Each soldier is attacked by 1 of the 2 snakes – if the soldier is attacked by the left snake, the symbol position becomes wild. If attacked by the right snake, the symbol position becomes a scatter. This gives you the chance to get wilds to get more wins or scatters to win more free spins. As in the base game, the Reactions and Medusa’s Gaze feature apply in the Free Games feature – this can lead to plenty of additional wins and wilds. Each reaction will increase the multiplier too. Finally, you can win more free spins by getting 3 or more scatters – there are no limits to how many free spins you can play with! Once the Free Games feature ends, the Temptation feature comes into play. You will be presented with 2 options – you can accept what you’ve just won or choose to replace the feature. I would only replace the feature if you want a bigger win or are not happy with what you’ve won. Finally, Medusa MegaWays comes with a Buy Pass feature – found in many other slots, you can buy your way into the Free Games feature for 100 times your stake. Medusa MegaWays has a lot going on – it’s pretty simple once you get playing. Basically, you can benefit from cascading wins and extra wilds in the base game. It’s all about the Free Games feature where each win/reaction increases the multiplier – there’s also unlimited free spins to be won. The Snake Strike feature helps where you get wilds or scatters which can lead to more wins/free spins. Variance wise, Medusa MegaWays is high – like other Medusa slots from NextGen Gaming. You can win a whopping 50,000 times your stake (capped) on each spin/free spin but the likelihood of winning big increases dramatically in the Free Games feature. Overall, great use of the MegaWays game engine by NextGen Gaming and could easily become the most played MegaWays slot available – top job as always from NextGen Gaming. If you want to see the originals of the snake-haired Gorgon, check out the original Medusa slot which remains a cult favourite. If you like the game engine, check our dedicated MegaWays slots section.